Expressionism is art that is more associated with emotion or feeling than with literal interpretation of a subject. Expressionistic art uses vivid colors, distortion, two-dimensional subjects that lack perspective. It's created to express the emotions of the artists as well as produce an emotional response of the viewer. I find it to be one of the most interesting forms of art because I love emotion. I believe emotion should be expressed more regularly and freely. Here in the United States, often our culture and society teaches us that we must hold back emotion when in public. These natural physiologically influenced, expressions of our human nature cannot be held back so sternly and still be healthy to our person. One of the most famous expressionists is the Dutch painter Vincent Van Gogh (1853-1890). His paintings seem to vibrate with emotion. Van Gogh suffered mental illness and died by his own hand. Could it be that if there had been fewer stigmas attached to mental illness and better treatment that Van Gogh would have not committed suicide? I can't help to think that even in this current time, we do not fully treat human emotion as it should be treated. And perhaps that leads to mental illness. 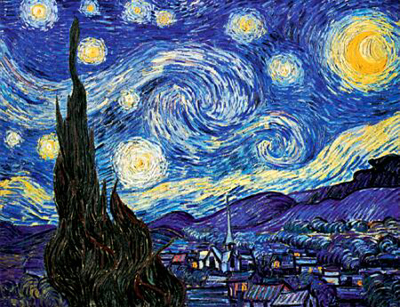 When I look at this painting, "The Starry Night", I see a happy, whimsical child-like expression. I see the moon and the stars and the clouds vibrating with energy and expressed joyfully through the brush and eye of Van Gogh. Perhaps if we were more open and honest with our emotions, we would have less murder and suicide. I am no professional of psychology, but intuitively I think we have a way to go when it comes to how we express emotion as a society, and how we treat others who suffer mental illness and profound emotions. In the United States, stigma is attached to mental illness. I believe that art should be taught as a therapy for anyone who suffers mental illness. How many expressionists are actually doing art in order to deal with their strong emotions? How many are actually a lot more mentally stable *because* of their artworks? Why is it that United States, Colombia, and the Netherlands and Ukraine have more mental illness than countries like Nigeria, Shanghai and Italy? Could it be that countries with fewer cases of mental illness express emotion in a more appropriate manner? Could it be that here in the United States, we'd be a lot healthier mentally if art was taught in school as a more serious subject especially when it comes to Expressionism?